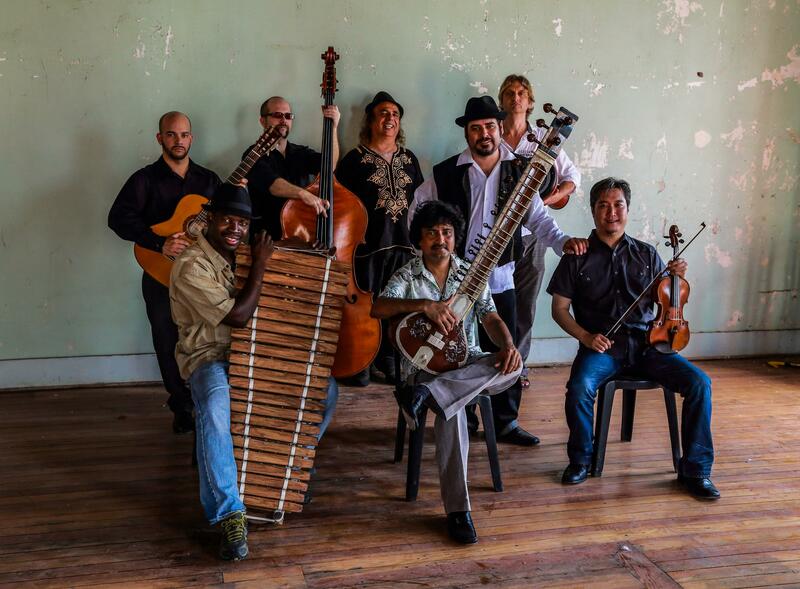 Interview with Austin-based World Music group Atash. Atash is a multi-cultural band based in Austin, so for them, lodging wasn’t an issue at the jam-packed South By Southwest festival. The members are from Iran, India, West Guinea, Africa, Cuba, Mexico and the United States. We started out talking about the band members, and also got into the subject of Islam and music during our interview. Deirdre Saravia: "Mohammad, tell me about yourself, where do you come from?" Mohammad Firoozi: "I was born in Iran and that’s where I grew up. I came to the United States in 1973, so I am from Iran but again I’m not from anywhere…I’m from planet Earth!" MF: "The name of the album, we are falling into a place where ‘Everything Is Music’ is taken from the mystic poet, Rumi. He wrote this poem eight hundred years ago at the time, when just like right now, [oppression] was happening in Afghanistan. Where musicians are being oppressed and being put in jail for expressing and just playing music, and this is what happened eight hundred years ago. He wrote that if you break our heart, if you break our instruments, it does not matter because we have fallen into the hands of love, the music is inside of us, so it does not matter if you break us down completely. We have fallen into a place where everything is music and there are hidden instruments everywhere." DS: "Well yes, those words a very nice sentiment, but music is banned in certain sects of Islam." MF: "Yes, but you know the chanting and the Call to Prayer in Islam is itself the music and I can give you a small example. When the Moors invaded Spain, they brought their culture and the music of Islam into Spain. I’m not an ethnomusicologist to say this for a fact, but when you hear flamenco music and flamenco singing you hear something of the Call to Prayer [audio below]..."
Mohammad Firoozi demonstrates the similarities of the Call to Prayer and the sounds of flamenco. "...Almost identical. And also there is a theory that when the Arabs invaded Spain, they brought the instrument the oud into Spain and when the Moors were thrown out, the Spanish resented that instrument as a symbol of invasion, so they broke it into the guitar. So now we say the oud is the grandfather of the guitar."